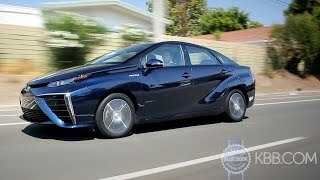 At the 2016 Detroit Auto Show Toyota did gave the sneak of future by sharing Toyota Mirai 2016. Looking at the model you might recall the FCV concept we saw a few years back. The model works on zero emission standards and gets power through hydrogen. Let us have a look at the descriptive review of Toyota Mirai 2016 to know in detail about its futuristic performance and other features. The interior of Toyota Mirai 2016 boasts a bold design language. The gorgeously designed dashboard presents a large center screen with Company’s Entune system that features navigation and entertainment. Instead of finding its house behind the steering wheel, the instrument cluster finds a place on top of the dashboard. Beneath it we have the center console with haptic control panel and a digital readout for the HVAC controls. The entire interior comes drenched in Piano-black plastic work. Getting back to the infotainment system, it includes GPS that will help you locate the nearby hydrogen fuelling stations. The model also comes equipped with features like, blind-spot monitoring, pre-collision, drive-start control, automatic high beams and lane-departure alert. 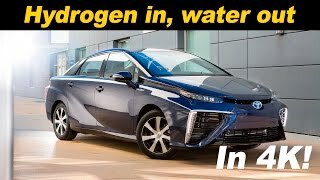 Thus rounding up the interior details of Toyota Mirai 2016 I would say, it is as innovative as one can expect from a model like this. 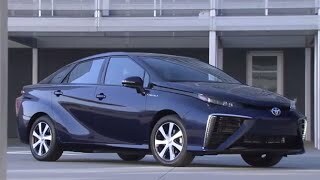 The exterior of Toyota Mirai 2016 is more of an amalgamation of Prius and Corolla. The front fascia is primarily accommodated by ‘literally massive’ air intakes while the slim headlights get accompanied by a unique character line that further connects till A-Pillars. You can notice sharp creases across the sides that make model look bold while the new alloy wheels further add to the gleam. Moving towards the rear end, model is equipped with newly designed set of taillights. The integration gets connected to each other through a light bar that run over the trunk lid. 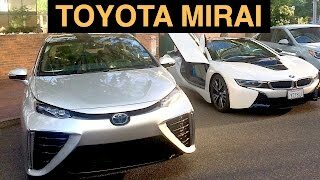 Thus rounding up the exterior details of Toyota Mirai 2016 I would say, it is bold with its sharp creases, elegant with color and aggressive with its front and rear end. 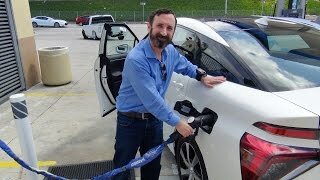 Powering the Toyota Mirai 2016 is a hydrogen fuel cell powerplant. Through its 3.1 kW/L of hydrogen the electric motor can produce total output of 153 hp and peak torque of 205 nm. The model comes with the company’s Power-Take-Off which mean you can use the power to light your house. With the power figures the Toyota Mirai 2016 can print from 0-60 mph in 9.0 seconds.